Authorities have also revealed that Blatter’s office has been searched and data seized. THE SWISS ATTORNEY GENERAL has opened criminal proceedings against Fifa president Sepp Blatter “on suspicion of criminal mismanagement as well as – alternatively – on suspicion of misappropriation”. The Swiss authorities have also revealed that Blatter’s office has been searched and data seized and he was interrogated earlier today after a meeting of the Fifa Executive Committee. The FIFA HQ in Zurich was also searched by members of the Attorney General’s office, with the support of the Federal Criminal Police. The 79-year-old had already cancelled a much-anticipated press conference in Zurich with no reason given – something which aroused plenty of suspicion. Meanwhile, Uefa president Michel Platini spoke to authorities after being asked to provide information. The authorities are investigating two specific transactions. In September 2005, they believe Blatter signed a contract with the Caribbean Football Union (with disgraced, former Fifa executive committee member Jack Warner as the organisation’s president at the time). The contract is described by the authorities as ‘unfavourable for Fifa’. They believe Blatter went against the interests of the world football governing body and/or Fifa’s commercial side by participating in the agreement. Also, Swiss authorities say Blatter is suspected of a ‘disloyal payment’ of 2 million Swiss francs to Platini (who is standing for Fifa president next February) in February 2011. The payment was allegedly made for work carried out between January 1999 and June 2002. It remains to be seen how his involvement in all of this may impact Platini’s run for Fifa office. This latest news has sent reverberations around the football community. Blatter, in the Fifa high-chair since 1998, has withstood a litany of controversies throughout his presidency and managed to survive. But earlier this year, Swiss police raided a Zurich hotel and arrested a litany of top Fifa officials and football-related figures. It was later revealed that the governing body was at the centre of two investigations – one from local authorities and the other led by the US Department of Justice. One of those arrested at the time was Jeffrey Webb – a younger and well-regarded Fifa member, a Blatter supporter, a vice-president of the organisation and widely seen as Blatter’s potential successor. Still, Blatter stood unopposed in the presidential election which followed but then performed a spectacular U-turn, announcing his intention to walk away at the next Fifa congress which was eventually fixed for February 2016. Bit by bit, the empire he has built has slowly crumbled, with a collection of well-worn, long-term Fifa faces forced to step away. The latest of these, Jerome Valcke, was Blatter’s right-hand man but was suspended until further notice last week after allegations of corruption. FIFA has been cooperating with the Office of the Swiss Attorney General (OAG) and has complied with all requests for documents, data and other information. We will continue this level of cooperation throughout the investigation. Today, at the Home of FIFA, representatives from the Office of the Swiss Attorney General conducted interviews and gathered documents pursuant to its investigation. FIFA facilitated these interviews as part of our ongoing cooperation. Email “Swiss authorities open criminal proceedings against Fifa president Sepp Blatter”. 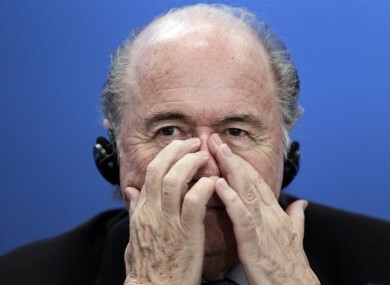 Feedback on “Swiss authorities open criminal proceedings against Fifa president Sepp Blatter”.